LNG could well be an alternate fuel of choice for CVs in India. There is little doubt that CVs are at the forefront of technology change when it comes to reducing pollution. No CV maker is known thus far to have employed a cheating software or similar such means to comply with emission regulations like some car makers have been accused of having done. CV makers are instead in news for trying out different technologies to ensure that their CVs are not only safe, but also efficient and green. A part of this endeavour is the development of technologies with LNG as fuel. In India, Tata Motors has been at the forefront of LNG CV development. It was in 2014 that the CV market leader announced that it has carried out a preliminary evaluation exercise with Indian Oil Corporation, which has LNG terminals in Gujarat, Kochi and Mangalore. The long standing experience of making and selling CNG CVs helped since the same engine family could be used to run on LNG. What made it advantageous was the range. LNG tanks could provide a CV with a 800 km range. The challenge would be the LNG tanks in terms of their technology and cost. It would be a challenge that could be tackled with volumes and acceptance. commerce and industry ministry, claim industry sources, has notified the amendments to rules governing use of cylinders carrying gas under pressure. This will help establish a storage and supply chain for LNG stations through ‘daughter trucks’, just like for CNG stations in cities, cited sources. With the use of LNG fuel for transport said to be a priority, a big hurdle in the way of using LNG to drive trucks and buses has been eliminated it seems. Oil minister Dharmendra Pradhan, in response to the letter issued by the commerce and industry minister Nirmala Sitharaman is known to have expressed that the proposed amendments will help in setting up the required infrastructure. 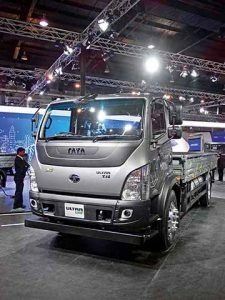 Apart from Tata Motors, Ashok Leyland, Mahindra & Mahindra and Daimler India Commercial Vehicles are known to be stepping up efforts to roll out LNG CVs. In what looks like a capable alternative to electrification of CVs, LNG powered CVs could soon find their way to the showrooms of various CV makers in India. Considering the emphasis on gas in US, it should not come as a surprise that many CV makers have applied for vehicle ‘type approval’. The process, claimed sources, will take two to three months. 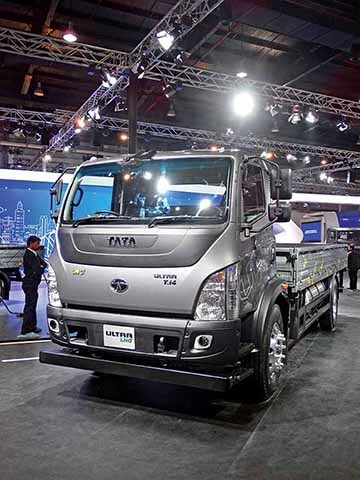 Expressed Girish Wagh, Head – Commercial Vehicles Business Unit, Tata Motors, that in the area of alternate fuels, they have unveiled Ultra LNG. 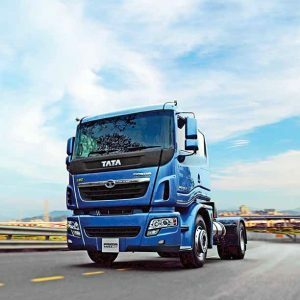 Terming the intermediate-level truck to be suitable for use on some routes in the country where there is a possibility of using LNG due to the existence of terminals, Wagh averred, “Demand for LNG vehicles could pick-up, and we are ready to address it.” India’s largest LNG importer, Petronet LNG is setting up 20 LNG stations at petrol pumps on highways along the west coast that connect Delhi with Thiruvananthapuram via Mumbai and Bangalore mention sources. They describe the distance as 4,500 km. The company is also said to be in talks with oil marketing companies for LNG facilities at petrol pumps. It is also known to be talking to the Petroleum and Explosives Safety Organisation for clearance. With 2.5 lakh new trucks and 85,000 buses estimated to join the LNG fleet every year, it is the road transport undertakings that could most benefit. They could begin by running a small number of buses on LNG in the initial stages. With the consumption potential of LNG put at eight-to-ten million tonnes per annum in the auto sector in the next five years, it would be worth applying the learnings from CNG in the development of LNG infrastructure. The development of Natural Gas industry in the country started in 1960s with discovery of gas fields in Assam and Gujarat. After discovery of South Basin fields by ONGC in 1970s, Natural Gas assumed importance. In 2004, liquefied Natural Gas was imported from Qatar and LNG terminal was set up at Dahej of 5 MMTPA capacity. Despite the push from various agencies and the judiciary that made all buses in Delhi turn to CNG almost overnight in 2001, the immense potential of CNG has not be exploited due to infrastructure constraints. In 2016, the Supreme Court issued an order to convert cabs run on petrol or diesel to CNG. All car makers have come to offer CNG models in their line-up. A big chunk of these models are lapped up by cab operators. The erection of an efficient LNG infrastructure rather than be limited to a distance of 500 km from a terminal along the coast, could prove to be useful to CV operators in the long-haul as well as the relatively short-haul segments. Long haul LNG CVs will contribute to curbing pollution, but the acute need is to reduce pollution in the cities. How LNG will help to do that, or will it be left to CNG or electrification to carry out that work, is a matter of debate, mentioned an industry expert. Stressing upon the price sensitive nature of the Indian market, he opined that the travel range restrictions any alternate fuel (CNG, electricity or LNG) may pose, will make it quickly unpopular. The learning from the CNG infrastructure or the lack of it should be put to good use, he said. Citing a report in a newspaper that LNG would make economical and environmental sense, S P Singh, Sr. Fellow & Coordinator, Indian Foundation of Transport Research and Training (IFTRT), said that the policy makers and media are at present obsessed with e-vehicles as an alternative to petrol and diesel vehicles to curb vehicular pollution, particularly in emerging smart cities across the country. CNG as city’s clean fuel, at the other end, for personalised, light and intermediate goods and passenger carriages in 174 cities and towns is work in progress. Opining that the biggest limitation for LNG as a highway fuel against petrol and diesel is the limitation of cryogenic tank suppliers, Singh averred, “The suppliers of Cryogenic tanks to store LNG have virtual monopoly. 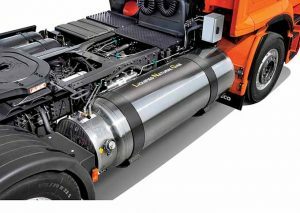 The high capital cost of a cryogenic tanker and trailer combination and uncertain supplies is a challenge.” Claiming that the suppliers of cryogenic LNG trailers of 24 kilo-litres are virtually predominantly in the hands of one single seller and manufacturer, Singh mentioned, “The prices are high, and the deliveries often take longer than expected. From a competitive point of view, this does not indicate a good situation.” Singh called for taming the virtual monopoly of cryogenic LNG tanker suppliers to ensure that its pricing power does not go against the participation of all gas-based logistics firms with working experience of two decades or more. Singh is of the opinion that LNG CVs will be more attractive than BSVI diesel CVs in terms of capital cost. “To make LNG a reality, the government should bring down the GST levied on cryogenic tank and trailers from 28 per cent to 12 per cent,” he quipped. Drawing attention to a 2015 Morgan Stanley report in which is mentioned that natural gas vehicles are globally displacing 1.5 million barrels a day of oil, commented an industry source that the number of gas powered vehicles, and prominently CVs is set to double. It could even grow by another 5.6 million barrels a day by 2021, he said. This would be equivalent to China’s oil imports in 2015, he elaborated. With a survey in Europe claimed to define the cost of a vehicle battery as equivalent to running an similar diesel-powered vehicle for two-lakh kilometers, LNG could well be the way forward. Top global CV makers like Volvo and Daimler are working on gas powered trucks even as they work on various other technologies. Director of environment and innovation at Volvo Trucks, Lars Mårtensson, is known to have expressed that natural gas can produce 20 per cent lower CO2 emissions than diesel. Because of its ability to be carried in larger quantities, LNG, according to an industry source, could just be the fuel for long-haul CVs. What may not make LNG suitable for last mile transport, he mentioned, is the high evaporation losses it incurs. As a fuel, LNG has its set of advantages and disadvantages. What seems to work in its favour is its ability to support long distance travel. Unlike electricity or CNG, which suffer from range restrictions, the development of an effective infrastructure should see LNG in good stead.